Welcome to this blog parade! 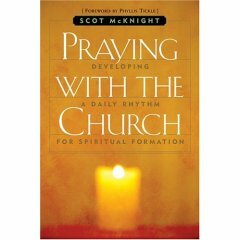 We're celebrating the release of Scot McKnight's new book, Praying With The Church: Developing a Daily Rhythm for Spiritual Formation (Paraclete: 2006). For a "map" of the blog parade route, click here. Dr. Scot McKnight is a new kind of scholar. He combines a skilled mind for scholarly research with a down-to-earth, passionate heart for walking with God and a quest to see the church unified in God's grace and love. Rarely does a book about prayer motivate me to pray. Julie, my wife, and I have read bunches of books about prayer as we for many years directed the prayer ministries of the church where I was teaching pastor. Scot McKnight’s new book, Praying With The Church, invites me and inspires me to pray. Julie, who is half-way through the book, also confessed, “This book makes me want to pray.” For this benefit alone I highly recommend Praying With The Church. The Foreword is by Phyllis Tickle who compiled the 3 volume The Divine Hours. Scot introduces us to the enduring discipline of “fixed-hour prayer” or “the daily office.” Scot’s story about how he searched for and discovered Francis of Assisi’s “little church” (the portiuncola) while on a trip to Italy with his wife, Kris, and why it relates to his book Praying With The Church I’ll leave for you to explore. Why develop this discipline? Because God’s people, Israel, practiced fixed hour praying; Jesus, himself a Jew, practiced his daily office and creatively expanded the Hebrew Shema and gave us “The Lord’s Prayer.” If you haven’t read Scot’s The Jesus Creed, now’s the time to do it. You can get a FREE copy---see below. It’s a great forerunner and foundation for his Praying With The Church; the early church practiced fixed hours of prayer, and praying at regular hours has been a Christian practice through the centuries. Scot, in a clear, accessible and friendly style of writing, presents several excellent chapters about Jesus as the supreme model of fixed-hour praying, defines the basic structure and purpose of a “prayer book,” and then examines four traditions that promote fixed-hour praying. The four traditions are: The Manual for Eastern Orthodox Prayers (including the “Jesus prayer”), the Catholic The Liturgy of the Hours (with appreciation to The Rule of St. Benedict), the Anglicans’ The Book of Common Prayer (with a word about Thomas Cranmer, Archbishop of Canterbury, and a tip about the BCP’s confusing fuss of colored ribbons), and finally Phyllis Tickle’s relatively recent The Divine Hours, a delightful 3 volume compilation of the previous three traditions. The Divine Hours is the “most user-friendly” book for ordered prayer. Spiritual formation occurs in a life moving to sacred rhythms. Scot welcomes us onto the dance floor where the saints of all ages become our partners in learning to pray and live the Jesus Way. Purchase Scot McKnight's Praying with the Church and McKnight's best selling book The Jesus Creed and you will receive your copy of The Jesus Creed for free! Reference coupon code PRBLOG and call 1-800-451-5006 or order on-line. (when ordering on-line you must enter both books on the order). I definitely look forward to reading this book. I was able to get one of the "free" copies, but have not been able to read it yet as I have a book or two in front of "Praying with the Church" to complete still. All I hear from reviews on this book, and again, affirmed by the start of this "parade" is that this book will make you want to pray, outside of your private prayer time. To join in the community of believers and pray with the church together aloud. I have not read Jesus Creed but I frequent Scot's blog on a daily basis to keep on his many running series of entries (currently Romans), so I am familiar with his writng style. I look forward to the blog tour to help establish a base for me to start with as i embark on this book in the near future. I've avoided looking at your site all day because I had too much work to do to get into blogging. But, let me say thanks for this, and what matters most to me is that the book motivates others to pray: what a compliment. This latest book of yours is going to encourage and expand people's praying experience. I'm glad I was asked to review it. Thanks for this review. I can testify that it does make one want to pray. It gives me a needed balance to pray set prayers, as we're instructed to do by Jesus with "the Lord's Prayer". I look forward to imbibing and practicing more and more the message of this book in the coming days and years.